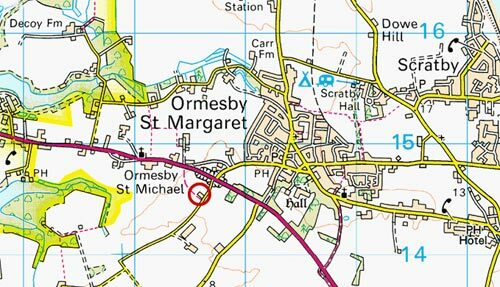 Ormesby St Michael was also known as Little Ormesby in the 1800s and was on the southwest edge of Ormesby St. Margaret. 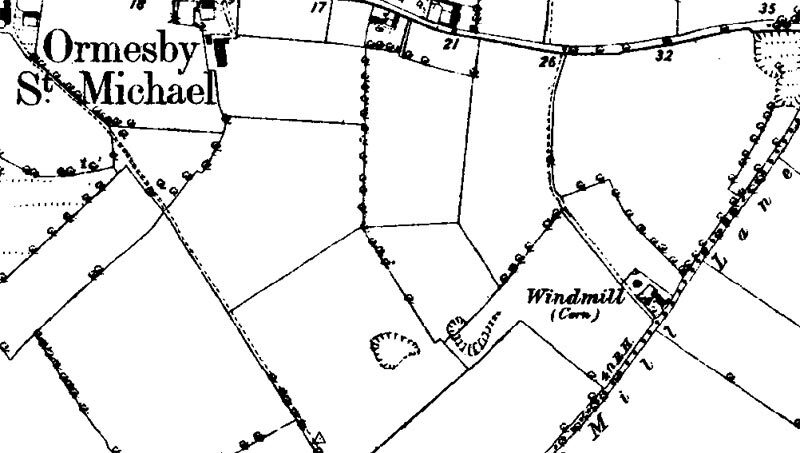 The post windmill stood in Mill Lane. The mill's roundhouse was reported as lately added in 1841, thus the mill was probably built as an open trestle mill with common sails and c.1856 the mill had patent sails and a fantail installed. ORMESBY ST. MICHAEL. To be sold by Auction by Mr. Pettingill at White Horse Inn, Great Yarmouth, Saturday 10 July 1841 at 4 o'c. By direction of the Exors. of Timothy Fellows, decd. 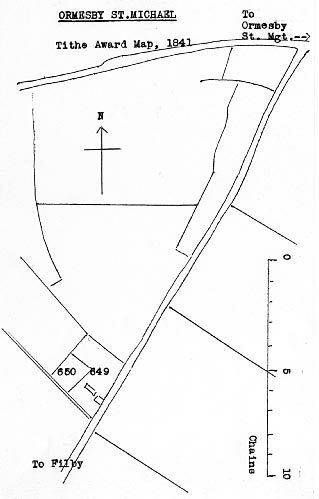 All that capital POST WINDMILL situate in the parish of Ormesby St. Michael in the County of Norfolk, with a superior Roundhouse lately added thereto, most substantially built and of the best materials. Also a convenient Double Tenement adjoining the Mill Yard, nearly new Barn and Stable, Garden and Yards containing together by estimation 1 rood or thereabouts, now in the occupation of Mr. Nathaniel Hammond as yearly tenant at the annual rent of £40. Freehold. Land Tax 12/- Free rent 3d. This lot is subject to an annuity of 40/- payable thereout during the life of a person aged 42 years. The mill stands well winded, with no other mill in this or the adjoining parishes of Filby or Rollesby and has carried on a good and profitable trade for many years. There is a well of great depth with most excellent spring water on the premises. Apply to Clowes & Son, Solrs. Great Yarmouth or the Auctioneer. Also Lot 1, Foster & Unthank, Solrs. Norwich. George Davey Durrant snr, who owned the mill, and also ran Hemsby towermill, went bankrupt in 1857. 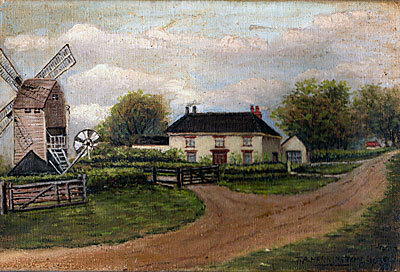 Capital Windmill, shop, dwelling house, and cottages. Clowes & Flowerdew are favoured with instructions to sell by Auction at the White Horse Inn, Great Yarmouth on Wednesday August 5th 1857 at 3 for 4 o'c. All that capital POST WINDMILL admirably situate in the Parish of Ormesby St. Michael in the County of Norfolk, with a superior Roundhouse most substantially built of the best materials all in capital repair, having had a new jumper, four patent sails and winding tackle added within the last twelve months. Also a convenient Double Tenement, barn, stable, garden and yard adjoining containing together 0a. 1r. 17p. in the occupation of Mr. Benjamin Starling as yearly tenant, who has for several years conducted a lucrative trade therein. Apply to C. H. Chamberlain Solr. Great Yarmouth, Miller, Son & Bugg, Solrs. Norwich or the Auctioneers, St. Andrews Hall Plain, Norwich. Lot 1. All that Capital POST WINDMILL admirably situate in the Parish of Ormesby St. Michael in the County of Norfolk, with a superior Round House most substantially built of the best materials, all in capital repair having had a new jumper, four patent sails and winding tackle added within the last twelve months; also a DOUBLE TENEMENT, Barn, Stable, Garden and Yard adjoining containing together 0a. 1r. 17p., in the occupation of Mr. Benjamin Starling, a yearly tenant, who has for several years conducted a lucrative trade therein. Lot 2. A newly erected SHOP & RESIDENCE ... near the Green in Ormesby St. Margaret ... Mr. George Starling ... general trade ... Both lots are freehold. For Particulars & Conditions of Sale apply to Mr. C. H. Chamberlin Solicitor, Great Yarmouth, Messrs. Miller, Son & Bugg, Solicitors, Norwich or at the Auctioneers' offices, St. Andrews Hall Plain, Norwich. A POST WINDMILL in good working order, driving two pairs of Stones etc. with Dwelling house and Premises. Has lately had a new Iron Shaft, Sails and Winding Tackle. Immediate Possession may be had if required. It will be sold to wind up an account at such a price as will be advantageous to a purchaser. For particulars inquire on the premises or to Mr. H. Martin, 32 Southtown, Great Yarmouth. A Norfolk Archaeology manuscript mentions that Ben Starling jnr and John Starling had been recorded as millers. I am a descendant of George Durrant Starling - miller. My mother, Mrs Annie B. M. Barklay née Starling, here in Australia has a painting stored away in a cupboard. It is labelled "Ormesby Mill - Norfolk" in my mother's hand. I was lead to believe that it is the Orlesby St Michael mill, however it seems that that mill was burned down in 1917 and the painting is dated 1938. I visited my mother last weekend and talked about the painting of the mill. She said that she was sure that my cousin visited Norfolk 15 or 20 years ago (she thinks) only to find that the mill had very recently been demolished (my comment - perhaps it was the house that had recently been demolished?). Have recently been following a particular line of family history research which leads me back, mainly, through the Empson family. I see from your website that you record them as living at the mill house on Ormesby St Michael in 1883. The 1881 Census records them living at the mill house two years earlier. John Empson was then aged 40 and is recorded as being born in Winterton. Elizabeth Watson Empson, also aged 40 is recorded as being born in Hemsby. I think that John is the son of James Empson, farmer, who is recorded back to the 1841 Census, variously as 'south of King Street' and 'near Lighthouse Hill. John was 9 months old at the time of the 1841 Census. Interestingly, John and Elizabeth appear to have been working as school teachers in 1871; John had previously been a Pupil Teacher and by 1881 their daughter Sarah Elizabeth was a pupil teacher in Ormesby School.